A White Marsh woman is extremely grateful for her recent birthday gift. She unwrapped a $50,000 top-prize winning 20x the Cash scratch-off. The 46-year-old Baltimore County woman said she received the scratch-off as an early gift from her father. She had spent most of that day cleaning, decorating and cooking in preparation for her weekend birthday celebration. The birthday girl was ready for a break when her parents dropped by for a visit, but she wasn’t ready for the surprise hiding in her gift. She scratched off the $5 instant ticket and revealed a match, but was unsure of how much she had won. The woman and her dad examined the ticket closely, noting she had a 20x multiplier over a $1,000 prize and several $5,000 matches. When they discovered her top-prize win, the family was in shock. 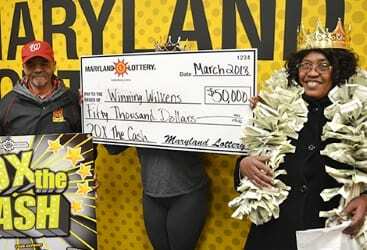 The happy woman claimed her prize, with her parents by her side, at Lottery headquarters in Baltimore. “Winning Wilkens,” as she dubbed herself, said her prayers for birthday blessings had already been answered. The winner has worked for a branch of the armed services for nearly 20 years and recently moved. She said the windfall will go a long way to help with bills associated with furnishing her home. The lucky lady also plans to share a portion of her winnings with her parents. Her dad found the 20x the Cash instant ticket waiting at the Royal Farms store located 898 South Marlyn Avenue in Essex. For selling a $50,000 winning scratch-off, the retailer earns a $500 bonus from the Lottery.